DVD Review | "In the City of Sylvia"
Four years after its premiere at the Venice Film Festival, and three years after its American theatrical release, Jose Luis Guerin's In the City of Sylvia is finally coming to DVD from the Cinema Guild. While the Cinema Guild has established itself as one of the strongest independent distributors in recent years, they have also started acquiring DVD rights to films they didn't distribute theatrically, such as Manoel de Oliveira's Eccentricities of a Blonde-Haired Girl, Guy and Madeline on a Park Bench and Pedro Costa's Ne Change Rien. 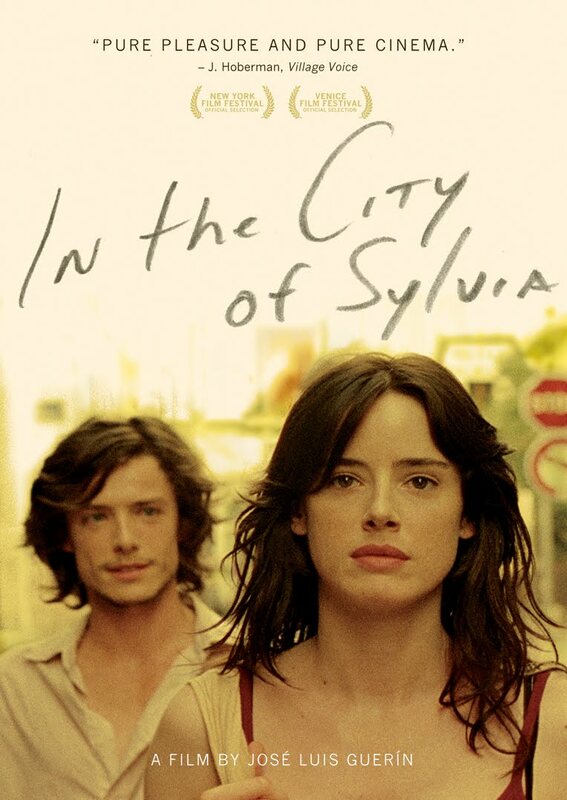 In the City of Sylvia was given a very small theatrical release in the United States in 2008 to a smattering of effusive critical acclaim, but then seemingly disappeared, with no sign of it on home video. But now Guerin's sublime meditation on memory and missed connections has been given the DVD treatment it deserves, and is available to a much wider audience than it ever was before. There's something reminiscent of the work of Manoel de Oliveira at work here, except in place of de Oliveira's characteristic formalism, there is a kind of fluid formlessness - a plotless but engaging drive toward feeling and emotion rather than a conventional story or specific idea. In the City of Sylvia unfolds like something out of a hazy memory; faded, sun-dappled recollections revisited on a warm summer day. It all revolves around a young artist who has returned to Strasbourg six years after meeting a young woman who changed his life forever. Determined to find her and reconnect with her, he spends his days languidly lounging around cafes and wandering around the city hoping for a glimpse of his long lost love. 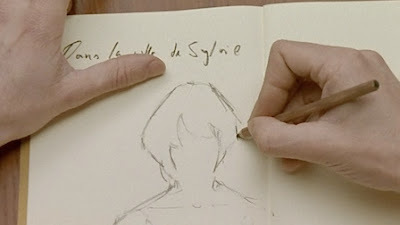 The film takes its time observing its surroundings, as the young artists hopes to spy the mysterious Sylvie, sketching the women he sees in hopes that one of them might be her. Who are these women? What are their stories? We only catch snippets of their conversations (dialogue is kept to a minimum), instead their stories are told through their faces, as the young artist studies each one, their mannerisms, their smiles, the emotions behind their eyes. Each one is a story unto themselves. Then, as if by magic, his eyes light up. We know immediately that he has spotted Sylvie before we even see her. His face tells us all we need to know. He follows her, and unwittingly embarks on a journey that will take him through the streets and back alleys of Strasbourg, chasing a shadow in order to recapture a dream. Like its protagonist, In the City of Sylvia ferrets off down back alleys and unturned corners, following paths that may or may not lead anywhere, not interested in the destination as much as the journey. Guerin is content to simply sit back and observe. And while the film's middle section is perhaps more driven by a specific story element than the rest of the film, it doesn't lead to where we thought it was going to go. Guerin nimbly avoids putting any kind of narrative form on his film - it's the world around the film where the real story lies; in the eyes of a stranger, an offhand gesture, always lurking just around the corner. For our young artist, happiness is always just around the corner, but it always presents itself as something abstract, a concept rather than a story, an idea rather than a plot. It's there, but it is felt rather than seen. The effect is strangely hypnotic. We are given little plot, little history, and yet the plight of the protagonist remains endlessly compelling and lushly romantic. Our artist is chasing a dream, and his singular determination is both beautiful and endearing. Guerin draws the audience in with an intoxicating simplicity, linking together images, sounds, and music that add up to something uniquely magical. As usual, Cinema Guild's presentation doesn't just add throwaway extras for the sake of padding. The extras enhance the film, and include Guerin's 2007 film Some Photos in the City of Sylvia, which strings together photos from the director's own trip to Strasbourg that provides a sketch of the film that would eventually become In the City of Sylvia. Like the drawings in the young artist's book, the extras open up a window into the artistic process. It's a fascinating insight into the evolution and inspiration for the film. It's a fitting package for one of the hidden gems of the last decade - a beautiful and poetic paean to youthful love and second chances that stands tall as one of the most significant DVD releases of the year. IN THE CITY OF SYLVIA | Directed by Jose Luis Guerin | Stars Pilar Lopez de Ayala, Xavier Lafitte, Michael Balerdi, Laurence Cordier | Not rated | In French w/English subtitles | Available on DVD from the Cinema Guild on Tuesday, May 24.
Review | "Tuesday, After Christmas"
Review | "The Double Hour"
On "Pirates of the Caribbean: On Stranger Tides"
Review | "Bill Cunningham New York"
Review | "The Topp Twins: Untouchable Girls"
Review | "City of Life and Death"
DVD Review | "Guy and Madeline on a Park Bench"